Natalie A. Jaresko was appointed the Minister of Finance of Ukraine by the Verkhovna Rada of Ukraine on December 2, 2014. Prior to that, she was one of the co-founders and Chief Executive Officer of Horizon Capital, a fund manager with over $600 million under management. Simultaneously, Ms. Jaresko served as President and Chief Executive Officer of WNISEF, a position which she has held since February 2001. 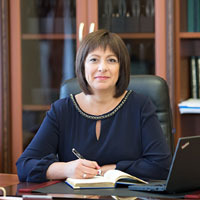 Prior to joining WNISEF in 1995, Ms. Jaresko served as the Chief of the Economic Section of the U.S. Embassy in Ukraine from 1992-1995, and in various economic positions at the State Department in Washington, D.C. from 1989-1992. Currently, she is the Chair of the Board of Trustees of the Aspen Institute Kyiv and a member of the World Economic Forum Global Agenda Council on the Future of Financing and Capital. In the past she served on the Boards of various organizations, including Ukrainian Catholic University, Kyiv School of Economics, Open Ukraine Foundation, East Europe Foundation, Pechersk School International, IMI-Kyiv, Kyiv-Chicago Sister Cities. She also served as a member of the President’s Foreign Investment Advisory Council, the Council of Competitiveness of Ukraine, and the Kyiv City Strategy 2025 Public Council. She is an alumni of the Ukraine Aspen Seminar. Ms. Jaresko received her Master’s Degree in Public Policy from the Harvard University Kennedy School of Government in 1989. She received her Bachelor of Science Degree in Accounting from DePaul University in Chicago, Illinois in 1987 and is a Certified Public Accountant (CPA). Ms. Jaresko received the Order of Princess Olha award from the President of Ukraine in 2003 for her contributions to the Ukrainian economy, a medal of honor from the Prime Minister of Ukraine in 2009 for her contributions to USA-Ukraine bilateral economic relations, as well as the Order of Nicholas the Miracle Worker from the Ukrainian Orthodox Church Kyiv Patriarchate in 2011.